London, 11 February: The scientific paper behind newspaper claims that insect populations were threatened with extinction was based on data known to be unreliable. That’s according to the Global Warming Policy Foundation, which today called for the paper to be withdrawn. 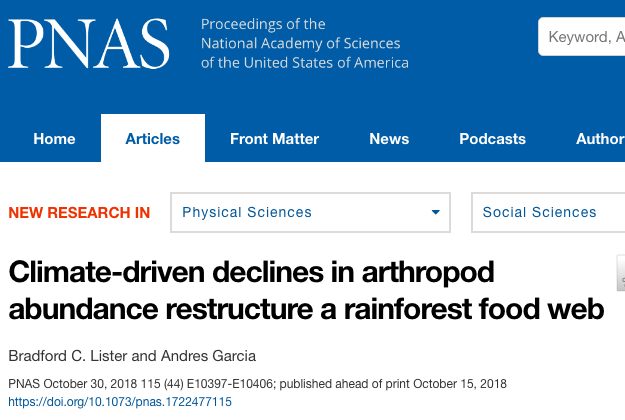 The paper, by US scientists Bradford C Lister and Andres Garcia, claimed that a rapid decline in insect populations in a rainforest in Puerto Rico was the result of rising temperatures. The Washington Post called the study “hyperalarming”, while the Guardian discussed climate change causing “insect collapse”. However, the authors’ evidence that temperatures had, in fact, risen turns out to be based on a single weather station, which was known to be unreliable because of undocumented changes to equipment and location resulting in a substantial and abrupt increase in recorded temperatures in September 1992. Since 1992, temperatures at this station have actually declined. The Global Warming Policy Foundation has issued a formal complaint to the Proceedings of the National Academy of Sciences, the journal that published the article, asking that the paper be withdrawn.